Lose the stem. Keep the cool. Crafted from the same high quality stainless steel as Canteen and Tumbler, Stemless helps keep your beverage of choice cold from the first sip to the last. 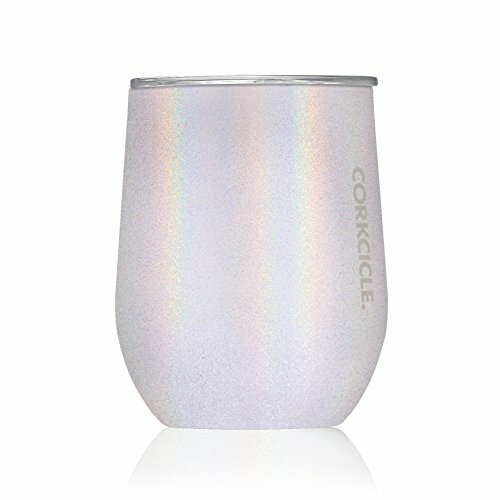 Perfect for wine, cocktails, tea, sangria and more. Features a unique slip-proof, silicone bottom, easy-to-grip sides and a sliding, spill-resistant lid. Keeps drinks cold for 9 hours or hot 3. AVAILABLE IN EXCITING NEW COLORS - Like all new Sparkle Pixie Dust and Unicorn Magic. TRIPLE-INSULATED STAINLESS STEEL - Keeps cold drinks cold and hot ones hot; By the pool, on the patio, at the office - wherever. ERGONOMIC FLAT SIDES; NON-SLIP, SILICONE BOTTOM - Our patented, easy-grip sides ensure that Stemless stays securely in your hand. The silicone bottom is designed to prevent it from sliding and spilling. SPILL RESISTANT-LID - Ensures that your drinks staying inside Stemless, not on you. Includes a removable silicone band for easy cleaning.